Three years ago my skin desperately needed some TLC, and after admiring a friend’s glowing complexion and hearing her rave reviews of Renée Rouleau, I made an appointment for a consultation. I had the pleasure of meeting with the celebrity esthetician herself, and instantly knew I was on the path to skin salvation. She prescribed a customized regime based on her nine skin types, as well as regular facials with fellow esthetician, Alison Tohlen (who continues to keep my skin looking radiant!). Since then, I have truly noticed a tremendous difference in the tone, texture and overall health of my skin, and I am so happy to have finally found a product line that keeps its promises. This, this and this are in regular rotation of my daily routine! 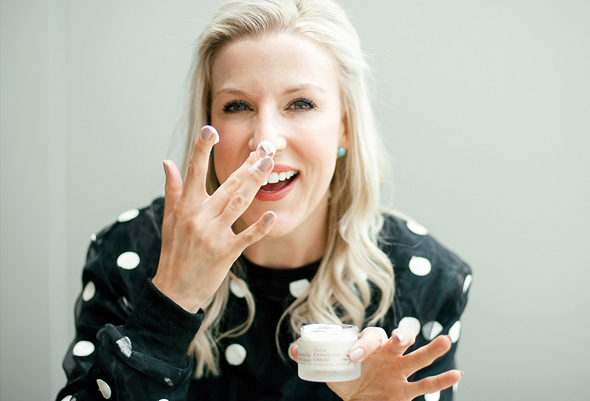 And so, with summer in full swing and many of us wondering how we can help our skin look and feel its best, here are the secrets from the expert herself, Renée Rouleau. Enjoy! We all know sunscreen is important, but does SPF really matter? A minimum of SPF 30 should be worn every day, rain or shine. Period. But did you know that the FDA is considering banning any sunscreen with an SPF of 50 since there is no scientific proof that it offers any more protection? The real secret to protecting your skin from harmful UV rays is to reapply often and generously—it’s really not the SPF number that matters. What can you do to help your skin heal after a sunburn? *Drink Cold Water: Since your body loses fluids when it’s overheated, it’s important to drink cold ice water to keep the temperature of the body down and internally hydrate. *Get Milk: Soak in the tub with lukewarm to cool water mixed with six cups of whole milk. This is helpful to lower the internal body temperature because the milk (due to the fat, protein and pH) can have an anti-inflammatory effect and provide comfort to tight, burned skin. *Apply a Lightweight Skin Oil with Antioxidants: After rinsing off a gel mask, I recommend applying a treatment oil, like Pro Remedy Oil, that contains antioxidants because sunburn is the ultimate sign of free radical-induced inflammation and skin damage. Types of oils to look for include pomegranate seed oil, cranberry oil and rosehip oil. *Apply a Cooling Gel Mask: The goal of treating sunburn is to decrease pain and remove heat from within the skin, so using a thick coat of a cooling gel-based mask, like Bio Calm Repair Masque, on the skin to lower the dermis’ temperature and bring water to thirsty cells can bring some relief. Place the mask in the refrigerator 30 minutes before use to increase the cooling benefits. *If you don’t have a gel mask, apply cold plain yogurt. When applied to skin, it works as an anti-inflammatory to reduce heat and irritation. Apply, let dry for 15 minutes, and rinse. Repeat every hour. *Don’t Over Moisturize: Many people want to excessively apply lotion in an effort to moisturize and heal the skin, but if you apply too much lotion, the heavy layers may create a barrier and trap heat in the skin, keeping it red longer. I prefer just a very thin coat of a skin oil. If you’re using lotion, be sure to use a thin one. Other than wearing sunscreen, what else can we do to protect our skin from the sun? Wear UVA/UVB-protective clothing, wear a hat, and wear sunglasses. Antioxidants such as stabilized Vitamins A, C and E, when applied topically and taken internally, are great at slowing the process of aging by stopping the free radicals from oxidizing the molecules. Foods such as vegetables and fruits (look for the darker pigmented ones) are high in antioxidants and are extremely important to consume daily. Any advice on banishing summer breakouts? With the heat and humidity in the summer, breakouts are a real concern for a lot of people. Cleanse skin more frequently. Oily skin should be able to tolerate cleansing up to three times a day, as long as you aren’t using a harsh cleanser. Be sure to use a cleanser that does not contain Sodium Lauryl Sulfate, Sodium Laureth Sulfate or Ammonium Laureth Sulfate. These dehydrate the skin and can cause it to produce more oil. If you are breakout-prone, not only will cleansing more often help to remove the shine from the skin, it can also help reduce blemishes. The reason for this is because bacteria thrive in oil, so the less you have on the skin, the better your chances for breakouts not appearing. For those prone to breakouts and increased oil production, summer is the time of year to lighten up and switch to an oil-free lotion. Avoid the ingredients mineral oil and petrolatum in your moisturizer, as these may create an occlusive barrier on the skin’s surface and potentially block pores, which can lead to bumps and possible breakouts. What are your top 3 tips for maintaining beautiful skin during the summer? *Give your skin more water and less oil. Summer heat brings increased oil production so it’s time to lighten up on the oil. Instead, give your skin water-based hydration. When temps are up, so is your skin’s internal temperature and this can cause water to evaporate from skin cells leaving them thirsty. Moisturizers keep both water and oil in the skin, but consider using a lighter (possibly oil-free lotion) and add in a water-based serum underneath with hyaluronic acid for added hydration such as my Skin Drink. *Re-apply your sunscreen. The key to protecting your skin in the sun is to re-apply your sunscreen generously at least every two hours. *Protect skin cells from oxidative and environmental stress. Applying topical antioxidants with a serum containing vitamin C and E is scientifically proven to act like a bodyguard for skin cells and help fight harmful, DNA-damaging free radicals that contribute to aging. Plus, vitamin C actually increases the effectiveness of SPF.